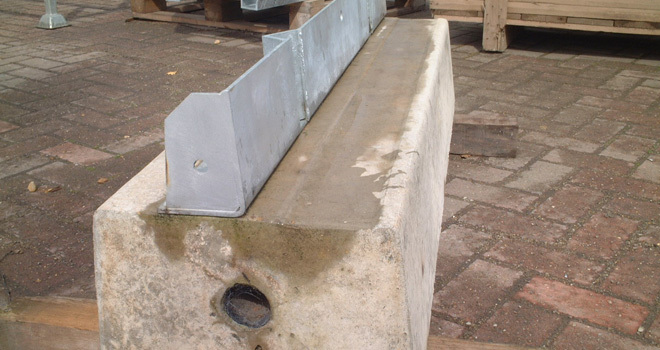 The Polysafe Ground Beam was designed to complement the range of concrete kerbs (also known as edge beams, cill beams, Bomac kerbs or edge kerbs). These are reinforced concrete beams with a galvanised steel road plate / upstand, the steel plate giving an even spread of the load along the beam. 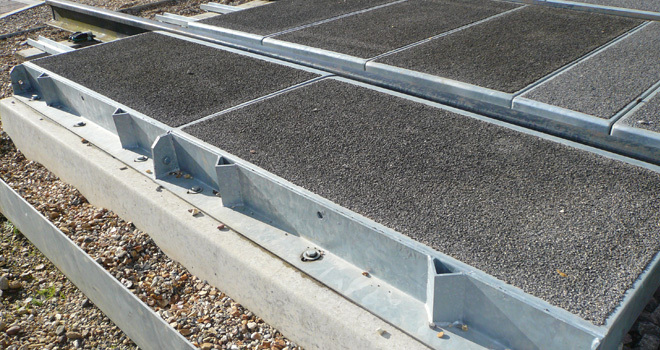 As with concrete kerbs they are used to support the cess / 6 foot / outer panels for Polysafe or Bomac level crossings. The 1.2 metre road plates are adjustable, making the ground beam particularly suitable for highly curved crossings as it gives some flexibility in following the curvature of the rail. They can be used for both new installations and maintenance. Ground beams are available in different lengths, so that in combination they suit the width of the level crossing. They come complete with an attached rubber supporting strip, meaning they are ready for installation upon arrival at the site. Polysafe also provide lifting hooks to enable safe lifting and minimise installation times.